ROAD CLOSURES FOR RACE WEEKEND! Street and lane closures will occur throughout the center city and surrounding areas for the Covenant Health Knoxville Marathon race events, which will be held March 24-25. All roads are expected to be open by 2:30 p.m. Sunday, March 25. An important consideration this year for race participants, volunteers and spectators will be interstate routes. According to TDOT, I-40 East and I-40 West will be reduced to two lanes from the West Hills exit (Mile Marker 380) to just east of the I-640 interchange (Mile Marker 385) for bridge repairs taking place weekends throughout March. The Clinch Avenue Viaduct serves as the start for all races and will be closed to traffic starting at 2 p.m. Saturday until about 2:30 p.m. Sunday. Parking will be prohibited on Clinch Avenue between 11th and 16th streets, and vehicles parked on the street will be towed Saturday evening. On Saturday, the Covenant Kids Run starts at 5:30 p.m. and the 5K at 7 p.m., necessitating closures of 11th Street and World’s Fair Park Drive in front of the former Candy Factory building and Knoxville Museum of Art, and periodic closures of Cumberland Avenue at 11th Street and Estabrook Drive from 5:30 until about 8:30 p.m. Motorists who need to reach Fort Sanders Regional Medical Center and East Tennessee Children’s Hospital on Sunday morning should take Alcoa Highway to the Cumberland Avenue/Kingston Pike exit and enter the Fort Sanders area via 20th Street. Please look for directional signage along this route. Maps of the courses are available at www.knoxvillemarathon.com. Clinch Avenue: Closed at the start of marathon, 5K and Covenant Kids Run from 11th to 16th streets. 16th Street: Closed at start of marathon, 5K and Covenant Kids Run from Clinch to Cumberland avenues. Volunteer Boulevard: Eastbound lanes closed for marathon and 5K to UT Drive on west end. Lake Loudoun Boulevard: Southbound lanes from Volunteer Boulevard to Neyland Drive closed for marathon. Neyland Drive: Eastbound lanes closed for marathon from Lake Loudoun Boulevard to Kingston Pike. Kingston Pike: Eastbound lanes closed; traffic will be two-way in westbound lanes. Newcom Avenue: Closed both ends from Forest Park Boulevard to Lebanon Street. Lebanon Street: Closed from Sutherland to Newcom avenues. Cumberland Avenue: Right westbound curb lane from 22nd Street to Tyson Park; south curb eastbound from Phillip Fulmer Way to Estabrook Drive. 22nd Street: Full closure from Forest to Cumberland avenues. Forest Avenue: Full closure from 17th to 22nd streets; continued closure from 17th Street east to 13th Street. Broadway: Right lane closed from World’s Fair Park Drive to Central Street. Central Street: Southbound right lane closed from Broadway to 3rd Avenue; northbound right lane closed from Magnolia to 4th avenues; southbound lane closed from Jackson to Cumberland avenues at South Central Street. Winona Street: Northbound lanes closed from Magnolia to Woodbine avenues. Woodbine Avenue: Closed both ends from Winona Avenue to Bertrand Street; local traffic only. Patton Street: Road closed signs on both ends between Jackson Avenue and Willow Street. Jackson Avenue: Eastbound lane closed from Patton to Central streets. State Street: East curb closed in right northbound lane to allow runners a lane behind cones. Hill Avenue: Closed eastbound to James White Parkway southbound entrance ramp, starting at Gay Street. Sevier Avenue: Right lane closed from James White Parkway to Island Home Avenue; cones 6-8 feet from westbound curb for runner lane from Island Home Avenue to Gay Street. Gay Street: Northbound right lane closed from Hill to Wall avenues. Market Street: Closed from Union to Church avenues. Church Avenue: Westbound right lane closed from Market to Locust streets. Estabrook Drive: Closed from Cumberland Avenue to Gate 25 at Neyland Stadium. 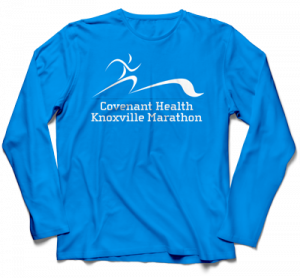 The Covenant Health Knoxville Marathon is a premier event organized by the Knoxville Track Club, a nonprofit 501(c)(3) organization dedicated to the encouragement of physical well being through running, jogging, competitive road racing, race-walking, fun runs, cross-country and track and field.